The Food Alphabet and More: Inboosta travel booster + Giveaway! Let's veer away from our usual programming, and talk about something I guess by today's standards is what we all need. You know you need it, you know you got to have it. And it might just actually save a life. In this day and age, when almost everyone has their own iOS or Android device, we live the mobile life, with most of our time spent outdoors, traveling, eating out, hanging out with friends, we could go on and on, bad sadly enough our iOS and Android Smart phones just can't keep up with us. Today's Smartphones are so powerful that when we use them for our everyday functions, you will definitely be looking for an outlet by late afternoon, just to get through the night, yes we all have those days. But with the onset of smartphones and the many functions it does so does it drains the juice of our batteries. Solution? Bring your charger wherever you go. So when you got a BB, an iPad mini and PSP with you, then you get to bring 3 chargers with you, all the time. Well good luck with that, or maybe I can give you the solution to all your portable power needs, Inboosta. Inboosta, the only portable travel booster you will ever need, is the latest, most compact, portable, lightweight and most versatile travel booster in the market today. With power and convenience in mind, it brings in the package, all that you will ever need to charge all your gadgets. Complete from the Inboosta battery pack, the USB to mini-USB cable, 4 adapter pins for micro USB and other gadgets, it takes away the need to bring with you different chargers just to get you through the day. Look good while combining functionality, Inboosta presents itself with different colors to match your lifestyle. Choose from red, purple, green, aqua blue, yellow or white, whichever you choose, you can stay secure, you have power whenever you need it. It features 4 LED lights signifying the capacity it still holds, click on the power button to show how many LED lights are still flashing to see how much juice you still have. Now I can charge my iPad mini anytime I need it, anywhere I may go. But of course don't forget to charge it when it drains as well. With the iPad mini at 4440mAH, my Inboosta IB5200RP Rainbow Series Plus is just enough to get my iPad mini from 10% to full charge in 2 hours with 1 LED still lit up, perfect to last me another 7 hours of iPad mini time. 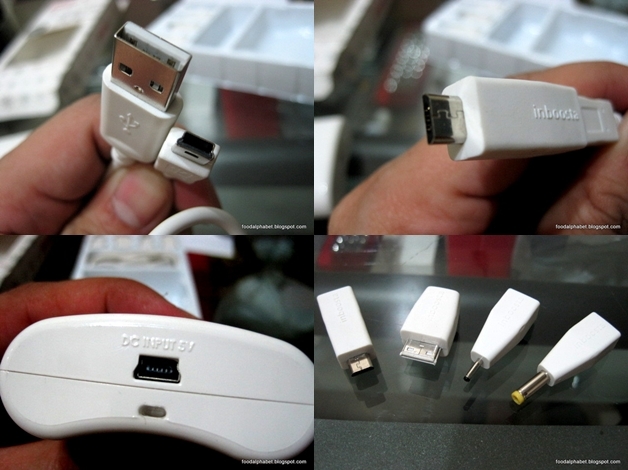 With capacities of 4,400 mAH at P1,990, my 5,200 mAH at P2,490 and 6,000 mAH at P2,990, even the smallest capacity Inboosta can charge your iPhone 5 (1440mAH) 3 full cycles! Now that's what you call power when you need it. So easy to use, so handy to keep, it's the perfect gift all of us need. Inboosta is now available at all Beyond the Box, Digital Hub and Digital Walker stores, get them while they're hot!